Our Sword of Rome Letter Opener by Marto is a replica of the sword of Julius Caesar (101 BC - 44 BC), the greatest military and political leader of ancient Rome. 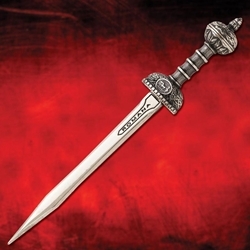 This Sword of Rome Letter Opener is a full-metal, miniature version of our Sword of Rome gladius. Made in Spain.